PRESS RELEASE: The London International Music Show (LIMS) is fast becoming one of the world's largest music making exhibitions and is staged in one of the world's coolest capital cities for music - London! Mapex will be at the show in force with a wealth of fantastic, exclusive opportunities for drummers, whatever your interest. The hugely popular Mapex Beat Street will once again provide a dedicated drumming environment in which you can turn up the volume and put a great selection of kits through their paces. Get up close and personal with the amazing brand new range of Mapex Meridian kits and hardware. A mix of both Mapex and Birch Meridian sets will be available for you A/B test. Find out why these award-winning drums are taking the UK by storm. Footage from Beat Street will be going up on the web throughout the show so keep an eye on Mapex.co.uk - you could be our next rising celebrity! 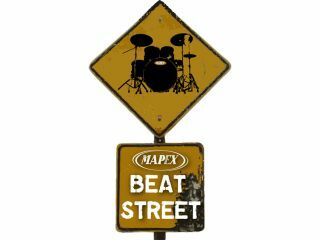 Look out for the signs for Mapex Beat Street at the show. See all the latest Mapex product releases including the Meridian, Chris Adler signature snare, 700 series hardware, VXB series and the updated Saturn series. To add a sprinkling of celebrity to the show mix, we are flying top International Mapex endorsee Nick De'Virgillio into the UK to kick off the Drummer live stage on the Saturday morning at 11:15am. Nick offers one of THE most enjoyable shows around. With his multi-instrumental talent and refreshing approach to playing and producing music, he is a musician who will inspire, what ever your musical taste. There will also be some Mapex and Paiste branded wristband giveaways on the stand, so book your ticket and get there early to avoid missing this fantastic opportunity to spend the weekend enjoying all things DRUMS!